When the Rhine beckoned, I answered the call. I’d long dreamed of sailing the great rivers of Europe on a Viking River Cruise, and this May I sailed on the Viking Hlin (pronounced “Lin”) with a friend on the Rhine Getaway, one of Viking’s most popular itineraries. 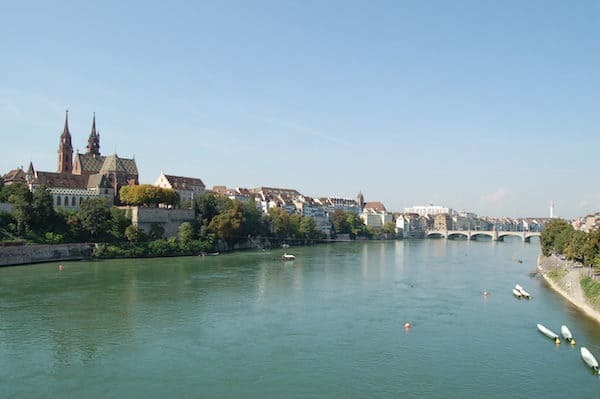 Our trip began in the gateway city of Basel, Switzerland, on a cloudy Sunday morning. Most stores and museums were closed, but the small historic city center was bustling with activity for a road race. We were tired from our overnight travel from JFK so we took a short walk around and then headed back to the ship for a nap before dinner. Overnight, we sailed 60 miles north toward Germany and France and the famed Black Forest, the setting for many of the Grimm Brothers’ fairy tales. At a rainy stop at a tourist village consisting of three shops and a hotel, we watched a chef prepare a Black Forest Cake and learned how cuckoo clocks are made. Though the stop felt less than authentic, we enjoyed the cake! The following day we arrived in Strasbourg, France, where my friend and I indulged in a 7-hour Alsatian Wine and Cheese Tour of the city, led by our guide, Valerie of Food and City Tours. Strasbourg was by far my favorite stop on the Rhine, not only because it’s in France but also because of the delectables we sampled—cheese, wine, gingerbread, tarte flambée (French flatbread pizzas) and chocolates at Patisserie Christian. But I also enjoyed hearing about the unique history of the city, which has been treated like a ping-pong ball by France and Germany for centuries, even going so far as forcing the residents to change their national language at various times. Day 4 brought the Viking Hlin to Heidelberg, home of Germany’s “most romantic castle,” high on the hilltop and complete with a grass moat. Our guide, an American philosophy PhD candidate named Will, did a great job of explaining the complicated history of the castle and Germany’s philosophers and kings. His enthusiasm for the subject was catching! After the castle expedition, we toured the charming town of Heidelberg and enjoyed a coffee at one of the street cafes. Almost midway through our cruise, the next day began with a sail through one of the Rhine’s most scenic regions, dappled with castles, small towns and tall, green riverbanks. By afternoon, we arrived in Koblenz, a traditional German country town, where we visited Marksburg Castle—a perfectly preserved medieval castle. The walk was all uphill and the castle floors were treacherous for even the most sure of foot, but the view from the top made the climb worthwhile. Refreshed from the night’s sleep, we arrived in the city of Cologne, Germany, the birthplace of eau de cologne (originally developed to mask offending body odor). Our guide, Udo, gave us sterling tips on how to avoid tourist traps and clued us into the names of the two original colognes (Farina and 4711) to sample. He also showed us the largest Gothic cathedral in northern Europe. We had the afternoon to spend on our own walking through Cologne and visiting its many museums and beer halls. Our last night on the boat we had a farewell dinner of surf and turf, and traveled overnight to just outside Amsterdam, where we were transferred to Schiphol Airport for our flight home. Viking caters to American, Canadian, British and Australian travelers with a decidedly English-language focus onboard, which makes traveling to foreign destinations less stressful. It is also a supremely convenient way to travel through Europe, as all of the details—accommodations, destinations, tours, food, transfers—are taken care of as you sail along. At most stops, Viking offers a complimentary shore excursion, such as a walking tour, as well as optional add-on excursions. The tours were universally excellent, with dedicated buses and tour guides just for Viking clientele. Frequently, we were instructed by Candi, the program director, to take audio listening devices from our cabins with us on tours so all could hear the tour guide as we meandered about. All cabins on the specially designed river Longships that Viking sails feature a slider with either a railing or a veranda that you can sit on and watch the sights of the river go by. You can also watch from the sundeck or the Aquavit Terrace, a combined terrace and lounge at the front of the ship. The décor is simple and streamlined with a Scandinavian aesthetic. There are many nice touches and included amenities: a hotel-style bed with luxurious linens and pillows, a heated floor in the bathroom, American-style 110-volt outlets, free Wi-Fi access, a refrigerator, a hairdryer and a 40” flat-screen TV that plays complimentary on-demand movies as well as television channels like CNN, MSNBC and a sports channel. The goal is “affordable elegance,” and Viking does it very well without nickel and diming you—for instance, lunches and dinners include not only coffee, tea and soft drinks, but also house wines and beers. The staff is extremely friendly and cheerful, always ready to help, very knowledgeable, and does a remarkable job of remembering guest room numbers and occupants! With a far smaller galley, the cuisine didn’t reach the gourmet heights I had experienced on some ocean cruises, but there were plenty of appealing, beautifully presented fish, meat and vegetarian options that offered a taste of local cuisine. After indulging the first couple of days in bacon and eggs and ordering off the menu, I fell into a pattern of preparing a mochaccino in the espresso machine on the third level of the boat and bringing it into the dining room, where I would select fruit and protein from the breakfast buffet. For lunch, I typically ate salad. For dinner, there were always two or three options for appetizers, the main course and dessert. The servers placed orders on iPods, which expedited the preparation and delivery of meals. Dress onboard was casual, even at meals. (No dress-up nights like you typically find on an ocean liner.) It was key to bring good shoes, as there was lots of walking—as is typical on any European vacation—and the terrain could be treacherous. At Marksburg Castle, for instance, there were no ramps that helped you traverse the extremely uneven castle floors. At the time of my sailing, the cost of the Rhine Getaway itinerary of 8 days and 4 countries (on the Rhine from Basel to Amsterdam) started at $2,649 plus air travel, and included shore excursions at most ports of call, port taxes and fees, and airport transfers on the date of embarkation and disembarkation if passengers arrange their air travel through Viking. Discounts and promotions may be available at various times of the year. The Rhine River season runs from April to November, but, since the river doesn’t freeze, there are also holiday cruises to visit Europe’s famous Christmas markets. *Guest contributor Nancy Monson is a freelance writer, editor and artist, as well as a health coach. Her articles on travel, lifestyle, health, nutrition, crafts, creativity, pets and entertainment have been published in numerous magazines, such as AARP The Magazine, Family Circle, USA Today Go Escape, Woman’s Day and Women’s Health. She is also the author of three books. All photographs courtesy of Nancy Monson unless otherwise noted. Disclosure: Nancy Monson was a guest of Viking River Cruises but any opinions expressed in this post are her own. What a great recap. Looks like you had a great time, and made every minute count. Love your photos!